Surrey Cycling Strategy Consultation ~ Read all about it! Home » Surrey Cycling Strategy Consultation ~ Read all about it! Five CTC members attended the once in a decade live Surrey Cycling Debate at Surrey UniversityUnfortunately little of the discussion was on Surrey’s Cycling Strategy. Concerns were expressed by Surrey residents about the behaviour of cyclists and the number of cycling events in the County and their impact on access and business. Both the police and residents spoke about poorly supervised and undisciplined sportives. In many respects a lost opportunity to debate the strategy and develop common ground. Over the past month the Surrey Cycling Strategy Consultation has been taking place. Your committee has made an official response, as has Guildford’s Cycling Forum. Keith Chesterton, who some of you will know, has been keeping some of us in the loop with information. There follow some links and copies of emails which will, I hope, put anyone wishing to learn more, in the picture as far as the current status quo is concerned. I attach draft minutes of the last meeting. Please advise me of any alterations needed. It might be possible to rearrange but it would need to be before Nov 26th. Transport starts on page 33 of the Local Plan Strategy Issues & Sites document, where cycling & walking are dealt with briefly. It is important that you read this section before the meeting. If you can’t come, please send me points before the meeting. PLEASE NOTE – We have changed the date. It is now MONDAY NOVEMBER 18th (& NOT Tues 19th) We changed owing to a number not being able to make the Tuesday. The Meeting will be at 6pm in the Council Chamber at Guildford Borough Council – we will occupy a small part of this. Please let me know whether you can come on this revised date. I attach draft minutes of the last meeting (circ previously). Please advise me of any alterations needed. 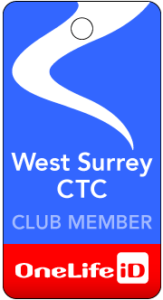 The link to the minutes of the Forum meeting dated 22 October may be found on the West Surrey website under ‘Downloads’. *Please note that these documents are exactly what was sent out. I’m not convinced the titles correspond to the content exactly, but fathoming it all out seems very complicated. Our Committee’s formal response to the Surrey Cycling Strategy may be found on the West Surrey website under ‘Downloads’. 1. Whilst narrow the towpath is increasingly used to avoid the gyratory. Further improvements to the surface would not cost much and take much traffic off road. A ramp to the bridge at Dapdune, and widening of the path onward east to Woodbridge road would also help. 2. I believe the A3 underpass with the Wey at the Woodbridge site to be a very economic option and was pleased to have support from Chris Peck,CTC and John Gibson,NT. I do not understand the lack of enthusiasm elsewhere. The main purpose of the meeting is to agree our response to Guildford’s consultation on its Local Plan. Additionally, Dave Sharpington will bring a set of A3 copies of the town centre so everyone has them, so it’s a point of reference without going through them in detail. He’ll also bring along some cycle guides so we have some maps of the whole Borough. He will also put on the maps his suggestions for routes so far. People can then take the maps away, add their own ideas and bring them back the next time the Forum meets, when we’ll collate them on to one big map.